Charles Thomas arrived at the front lines in Belgium in May of 1915. He would not see the family farm again, just south of Bolton, for four long years. Over this time he was at the centre of everything that made up the Great War, from the death and horror and relentless drudgery of the trenches to the eye-opening experience of a Canadian on leave in London. The letters Charles wrote home to his mother. Photo by Pete Paterson. In a steady stream of letters home, Charles described his wartime life in a reassuring and almost newsy way, but in a closely held diary he recorded his days with more brutal truth. Both writings reveal a sensitive man coping with his place in a war that involved much of the Western world, and in which he was immersed every day in his dangerous role as a sapper. The 1st Canadian division was posted to the front lines of the deadly Ypres Salient on April 1, 1915. Charles was in the trenches in May, by which time Canadians had fought in the battles of St. Julien and Festubert, and faced gas for the first time. On the day Charles arrived, his commanding officer was killed before he could report in. Diary, May 25, 1915: Put in first night’s work in the trenches, a German communications trench they had evacuated and blown up. Changed this into a firing trench, putting in two machine guns. The Germans still occupied one end of the trench … Could hear the enemy talking and driving stakes … near Festubert. May 27, 1916: Put in second night … It was near here 48th found two young girls killed in German trenches. Their bodies were still warm … We went on through Richebourg (which has been shelled until not a house is left standing …We waited there during which time the Germans shelled the road … snipers between our lines … Fighting everywhere. Carnage at the front had moved John McCrae to write the famous “In Flanders Fields” just as Charles was taking up his duties. McCrae’s dressing station was a few miles from Charles’ first trench, which means he and McCrae were reacting to the same general situation. They record their experiences, however, in very different language. June 15, 1915: Captain Morrison of 1st Field Company killed this night. July 7: Sergeant Turner shot thro neck today, but missed jugular. July 13: Three casualties today. Corporal Cook wounded, hit on head by piece of shell … Sapper Davey hit on hip … Sapper Leslie … shot through kidneys. August 31: Two men hit this night, Sapper Hifle shot through head (is still living at noon next day) and an infantryman who died in an hour. April 26, 1916: Lt. Morrow killed by bomb early this morning. Sgt. Ward and Spr. Barrett wounded near Hill 60 … Spr. Barrett wounded with bullet thro stomach, died on 28th. An equally dark inventory continues in the diary through 1916. 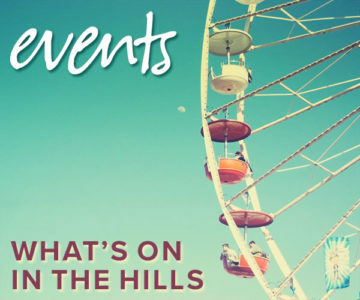 February 5: Spr. Whitmet killed at the cutoff at D4. Trenches are only 35 or 40 yards apart here. April 27: Transports shelled … last night, one horse killed. Sgt. McLean run over, Cpl. Deeve of No 1 Co. hit … Stout wounded. April 28: Very heavy bombardment during the night. Driver Wilson went to hospital suffering from shell shock. June 13: Brobyn killed [Brobyn had come to Belgium with Charles]. Wounded – Sgt. Morrison, Spr. Westonholmes. Shell shock – Spr. Gardiner. June 30: Our company lost 10 men. One of the wartime diaries of Charles Ernest Thomas. Photo by Pete Paterson. The truly serious rat problem in the trenches, however, Charles confined to his diary. In October 1916 he was posted opposite Vimy Ridge (Canada’s famous conquest was still seven months away), an area he described as: … the worst place for rats yet … [They] ate my emergency rations last night … One fellow had his haversack eaten open last night and three packets of Old Chum tobacco carried away by rats … They also carried two hard biscuits off Spr. Oliver, eating a hole in his overcoat to get them. A curious feature of Charles’ diary is the steady recording of aircraft activity in the skies above him. The natural human tendency to watch action in the sky was accelerated in the trenches because of snipers. Looking up was safer than standing up. Charles, like his fellow soldiers, watched dogfights in the manner of spectators at a big league game. August 11, 1915: Several aeroplanes up this afternoon, British and German. One large British biplane particularly daring. One German brought down by our planes and anti-aircraft guns. March 31, 1916: The German aeroplanes, at least the German Fokker machine, was able to put it all over any we had in the neighbourhood of Bailleul. March 11, 1917: Very much aerial activity. Saw five scraps, 3 planes brought down, one of ours, one of Fritz, doubtful about the third … The Germans have some very fast machines here. Of course there were times when Charles and his fellow soldiers did stand safely upright, especially when dignitaries showed up well back of the lines. July 21, 1915: Reviewed by Sir R.L. Borden, accompanied by General Alderson, General Turner and Prince Arthur of Connaught. [Alderson was the original British commander of the Canadian forces]. August 8, 1915: Engineers were reviewed by Sam Hughes, Prince Alexander of Teck and General Alderson. October 27, 1915: The King is out here now … The roads were lined with troops cheering him as he passed along. These visits told the soldiers they were the spear point of a huge event, but frustration rose at how little they knew of the big picture. In September 1916 Charles grumbled to his brother, “So the Canadian papers know all about our journeys before we do.” His diary too revealed a fog of misinformation. Worst of all for men like Charles was not knowing what happened to their pals. On September 30, 1916, Charles notes in his diary: Spr. Drake being wounded leaves me the last one of our draft in No. 1 sect. Six weeks later: Received letter from Drake’s mother today telling me of his death. And Charles added this note to his original entry: Spr. Drake died on Oct. 10 at Rouen Hospital No. 12. He was admitted on 7th. Had most likely been at Contay hospital previously. ONE OF THE “LUCKY ONES”? Charles died in Bolton in 1962 at age 78. How had he survived the war when so many of his company had not? Could it simply have been a matter of luck? Was it the nature of his combat role at the front? He was a sapper, and sappers (also called pioneers or combat engineers) were the workhorses of the army, building, repairing, mining, excavating, and managing the infrastructure of trench warfare. Their work was varied as these typical entries from the diaries suggest, and much of the time extremely dangerous. 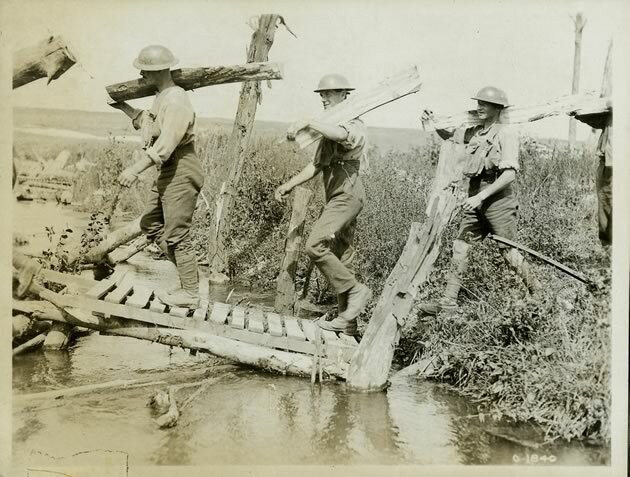 June 1915: … building pontoon bridge, knot tying, brushwork, making hurdles … Stayed here 4 days making ladders, barb wire entanglements, and putting bombs and gun cotton in dugouts … erecting an observation tower … Laying out new trenches and strengthening the front line. 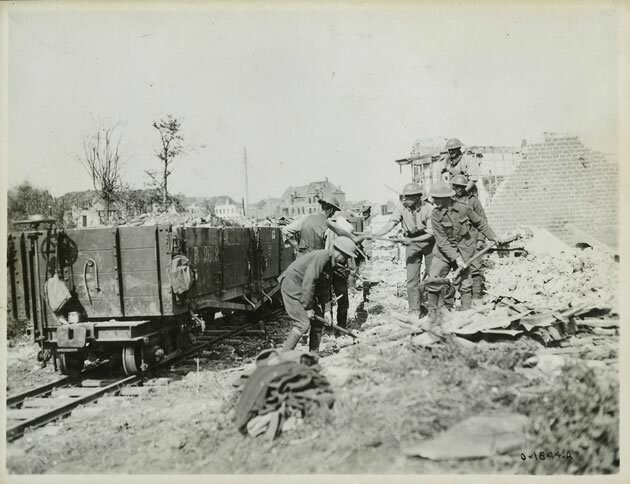 October 1915: Working on dressing station with first battalion. Putting in false roof to make it bombproof … working at night deepening a communication trench … Laying double track for handcars. 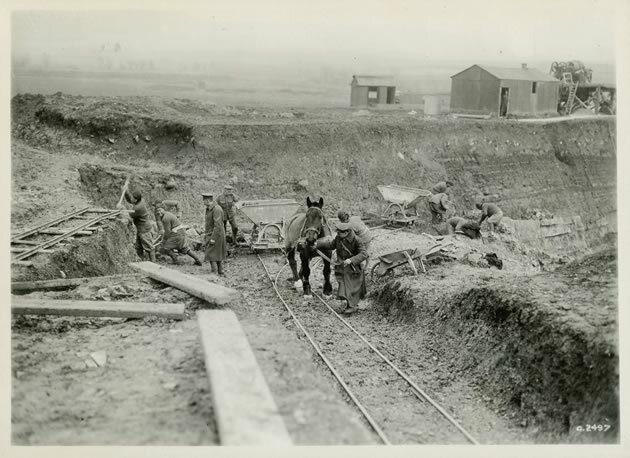 November 1915: Rain … rain … Working on drain behind C on 4-8 p.m. shift. Dirtiest job have been on yet … Drivers ran wagon I was on into ditch, in eight feet of water … Everybody pretty wet. Fortunately got the horses out, although two of them nearly drowned. February 1916: Was up at headquarters putting in glass. Some glazier! … Was a sort of brick labourer today, fixing oven at canteen. March 26, 1916: We are sleeping in a barn. First time back of lines for 10 months. April 11, 1916: Was up today over the ground. Every man you see says, “Keep your head down.” Wish I was 5 ft. high. May 1916: Our section is short of carpenters. Sergeant says I am a carpenter, so I guess I am one … The corporal says I’m not a carpenter. Corporal wins. June 28, 1916: Germans attacked Vancouver trench …Shelled these dugouts this morning – cookhouse which I was in – blown in. Close enough for me! December 19, 1916: The Germans attacked this morning … Did not notice the weeping gas [at first].We all had sore eyes and some of us wept quite a lot too. January 29, 1917: Not much work in the trenches, but God help us when it thaws. 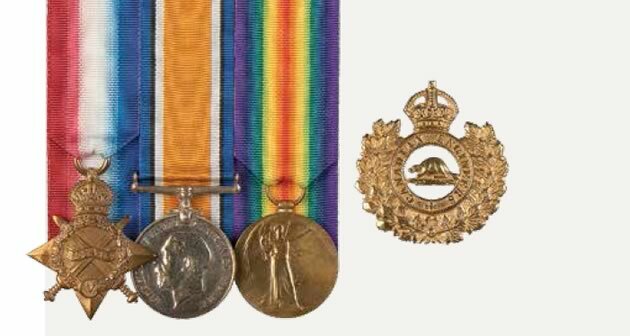 Medals awarded to Charles Ernest Thomas for his World War I service, along with his hat badge. Photo by Pete Paterson. At the end of March 1917, Charles was transferred to England. He had been promoted to sergeant (his rank at demobilization) and was selected for cadet school to become an officer. The timing meant he was not exposed to the insanity of Passchendaele in October that year, and he just missed the glorious but costly Canadian triumph at Vimy. A serious injury in cadet school, caused by a fall from a horse, led to a long recuperation and then reassignment to support duties in England. Charles never returned to the front. 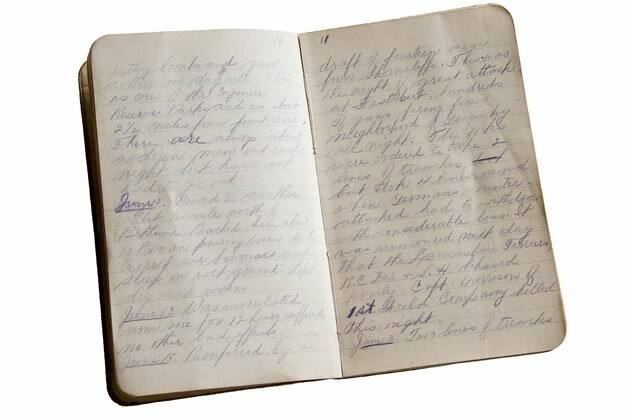 Over the final year of the war his letters home continued, but the diary entries decreased and almost disappeared. On November 11, 1918, as church bells rang out around the world, the weariness of his brief entry speaks volumes: It is finished. World War I images from the Canadian War Museum show the kind of work undertaken by sappers, or combat engineers, like Charles. They were the workhorses of the army, building,repairing, mining, excavating, and managing the infrastructure of trench warfare. 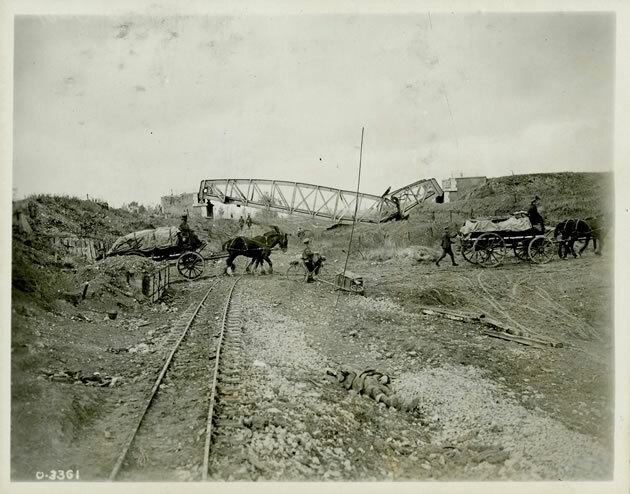 Crossing the Canal du Nord in France was key to a battle outside Cambrai in 1918. Charles spent October 1915 at Wulverghem, a village in Belgium directly on the front line that was reduced to dust by shelling. It was a site of extremely high casualty rates for both sides. That month he wrote a letter to his mother. You can only wonder how many times it was read late at night and then tucked safely away to be read again. 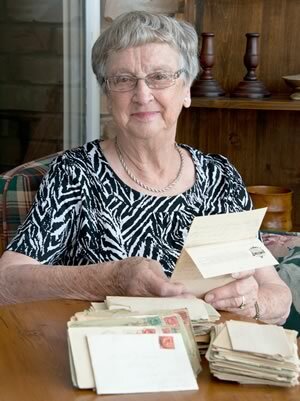 Betty Ward, the youngest of Charles Thomas’s five children (b.1933) is the keeper of his diaries, letters and war memorabilia. Photo by Pete Paterson. 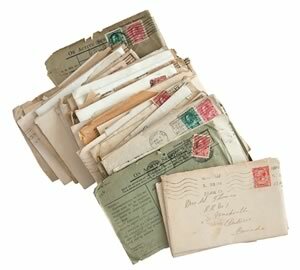 Betty Ward, the youngest of Charles Thomas’s five children (b.1933) is the keeper of his diaries, letters and war memorabilia. A retired teacher, she transcribed the diaries and letters over two years to ensure her siblings and Charles’ 10 grandchildren and 22 great-grandchildren each have a copy. A longtime resident of Caledon East and volunteer for many organizations, including the Caledon East and District Historical Society and United Church Women, Betty was named the Town of Caledon’s 2016 Community Champion. She recently moved to Orangeville. Saw the guard change at Whitehall, up the mall past Buckingham Palace and visited Kensington Museum. Saw Miss Unity More as “Peter Pan” at the New Theatre on St. Martin’s Lane in the afternoon and Phyllis Dore as “Tina” at the Adelphi at night … Visited British Museum in the morning. In the afternoon went to London Coliseum. Heard Sarah Bernhardt … Visited St. Paul’s and Tower of London. Went to Alhambra at night … Visited Westminster Abbey. Saw “Stop Thief” at the Prince of Wales Theatre at night. There was another aspect to furloughs. 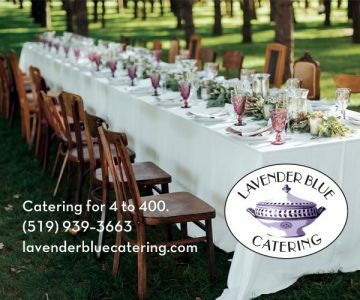 Canadian soldiers were considered the randiest in the war (a reputation supported statistically by the highest rate of venereal disease in any Allied army!) Given Charles’ commitment to church services and the intensity of his search for cultural fulfillment (he was even busier on his next return to England), it’s reasonable to suppose he did not indulge in this aspect of wartime activity. When Charles married Isabella Nattress in 1925 in the Methodist Church manse in Bolton, he likely did so with a clear conscience. In the city of Ypres (a.k.a. 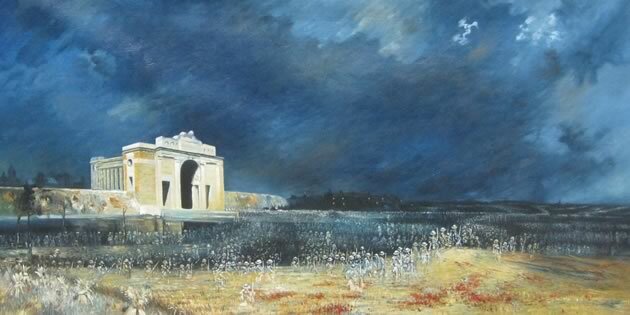 Ieper) in Belgium, the Menin Gate is one of four huge memorials to soldiers who died in the Ypres Salient but whose bodies were never found because of the endless mud and massive shelling. Carved into the walls of the Menin Gate are the names of 55,000 soldiers without a known grave. Of these, 6,940 are Canadian. On May 13, 1916, Charles wrote home excitedly to report that a local boy, Matt Agar from Nobleton, had been transferred into his company from the infantry. On June 13, his diary records: Attack successful! Whole line regained … Only one not accounted for tonight: Matt Agar. Joseph Matthew Agar’s name appears on Panel 10 of the Menin Gate.